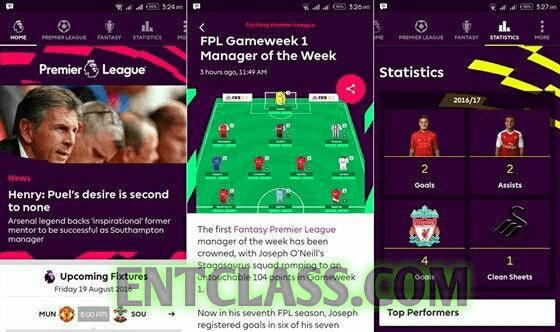 All the Football fans on this blog Entclass.com, i will be introducing to you guys and ladies the official Premier League Android app which will keep you updated to the world's most popular League. You will be updated with fixtures, news, results, videos highlights and even live scores all of this inside this app. The app is very easy to understand, has a very nice user interface and quite easy to use. As a new user, you will be asked to pick your favorite club(s), you will provide your Email address and also confirm your age. You can easily swipe from right-to-left to access all the features of this app. The first tab is Home [>Premier League =>Fantasy =>Statistics =>More. You can view live match commentaries of every Premier League fixture. You can also watch the latest video highlights. The most exciting part is the statistics for every team, and every Premier League player stretching through its 25-year history. WHERE CAN I DOWNLOAD PREMIER LEAGUE ANDROID APP? This app is currently on Google playstore and its free. It also comes with push notifications which alerts you of any information you need to know. Download Premier League app for Android HERE. Thanks Victor for this info. Would try the app out. Do you happen to know any app with which I can watch free football matches?